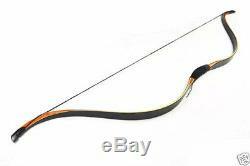 40lb Laminated Long Bow Recurve Bow Archery Hunting Chinese Bow Handmade Asian Bow High Quality Specification: Draw weight: 40lb Material: Maple , bamboo clip, Elastic fiberglass Overall bow length: 56/143 cm Draw length: 28 inches Color: brown Weight: 0.8kg Have a very good performance after testing! We have this bow in other pounds, you can contact me for that. It takes about 7-18 days! Any problem can be solved by communication! The item "40lb Laminated Long Bow Recurve Bow Archery Hunting Chinese Bow Handmade" is in sale since Wednesday, October 25, 2017.